TruCheck Optima™ delivers accurate and repeatable results for all 1D and 2D bar codes with a large field of view. 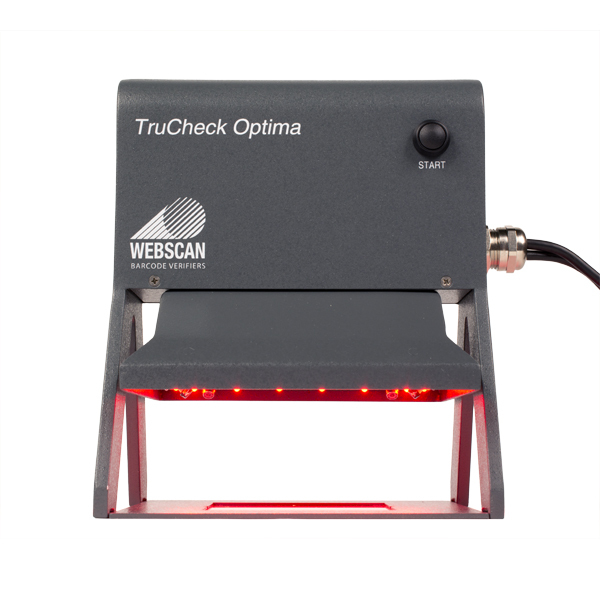 The TruCheck Optima™ from Webscan provides a fully integrated and portableTruMatrix™ imaging head that connects to a PC through the USB port. Simply position the imager over a bar code and press the button. Clear and concise results are displayed instantly. The graphic interface shows operators clearly where potential problems exist. There is nothing to focus and nothing to align. Webscan verification systems will ensure that your marketing efforts are effective. QR Codes are in compliance with industry standards for readability according to ISO 15415, ISO 15416, ISO 18004 and GS1 requirements. With its integrated illumination, and compact size, it is easy to move the unit to where it is needed. On a label, or even on an object. The design ensures that the image is calibrated and in focus. Features: • CCD Imager with Integrated Illumination • USB interface to PC • ISO grading, AS 9192, AIM DPM • Data export to printer, PDF file or Excel • Software easily upgradeable • Calibrated to NIST traceable standards • Parses and validates industry standard data formats • Variable aperture size See full specifications View a brochure (English) Webscan’s newest product is the TruCheck 2D UV with the ability to verify barcodes printed using invisible ink for track and trace.